Mystery Thai resort deaths from food? BANGKOK, Thailand (CNN) -- Thai authorities investigating the recent deaths of two female tourists suspect that the women may have died from food poisoning, police sources told CNN Monday. Jill St. Onge, a 27-year-old artist from Seattle, Washington, and Julie Michelle Bergheim, a 22-year-old Norwegian woman, died at the same resort on Thailand's Phi Phi Island just over a week ago. The results of the autopsies have not been released by police, who are citing privacy issues. St. Onge's fiance, Ryan Kells, accompanied her remains as they were flown to the United States on Saturday, her family told CNN. "Jill's ashes are now with her mother," Robert St. Onge, Jill's brother, wrote on a Web site created to update friends and family. "Thank God every one made it back safe." Thai police investigators have ruled out poisoning from the nearby water treatment plant, according to police sources on Phi Phi Island and in its province, Krabi. They are concentrating their investigation on whether the women died from food poisoning, either from food or beverages, according to the sources who did not want to be named pending the ongoing investigation. The owner of Laleena, the guesthouse where the women were staying, told CNN that his facility had nothing to do with the case. He had earlier said in published reports that he believes the women's deaths came from drinking heavily. St. Onge had been visiting Thailand with Kells at the end of a three-month journey, during which the two had become engaged. A week before her death, the 27-year-old woman wrote in her online journal a description of the surroundings near where the Leonardo Dicaprio movie "The Beach" was filmed. "Hey hey! We're in koh phi phi right now. It's off the west coast of Thailand about a 2 hour boat ride from krabi. So amazing ... just drinking eating and living so cheaply and having a blast. Food, drink, good books, sun and warm waters ... What else do ya need?," St. Onge blogged on April 26. On May 2, Kells found St. Onge vomiting in their hotel room. She had told him earlier that she had not been feeling well. He put her into a shopping cart and searched for help. "She couldn't breathe, she was vomiting," Kells, 31, told CNN affiliate KGO-TV. "I tried to run her to a hospital and she ended up passing within maybe 12 hours of being sick." Robert St. Onge said his sister had been healthy and that her sudden death was a mystery. "It's such a shock," he told CNN. "There was no way to hear last words or even see her because she has already been cremated." He said he had spent less time in their room than his fiancee. Norway's Foreign Ministry is still waiting for the results of Thailand's post-mortem examination, and is in constant contact with Bergheim's family, ministry spokesman Christian Hansson told CNN. Bergheim -- a student in Sydney, Australia -- had stopped in Thailand with a friend before returning to Norway, according to Norwegian state media. Her friend also became seriously ill, but has since recovered, the reports said. Norwegian newspaper Netteavisen -- citing local police chief Nopadon Klom Thong -- reported that traces of cyanide were found in the dead woman's stomach. The final autopsy results are not expected until Thursday, according to Norwegian media. 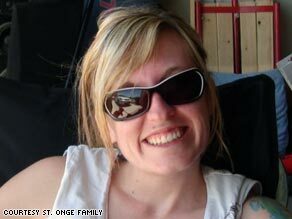 The U.S. Embassy in Thailand has been working with the St. Onge family, said Michael Turner, an embassy spokesman. "The police know we are concerned about this. But as with any investigation, it could take some time," Turner said. Robert St. Onge said Thai authorities told his family that the inquiry could take four to eight weeks. He said the family had been given tissue samples so they could have testing done by an independent laboratory. At Shadowland, the Seattle restaurant where Jill St. Onge used to work as a bartender, a corner of the bar is filled with pictures, candles and postcards from the couple. "Greetings from Phnom Penh," one from Jill reads, "We love you guys." CNN's Kocha Olarn, Patrick Oppmann, Per Nyberg, and Lateef Mungin contributed to this report.